For the past 21 months I have been working as a humanitarian aid worker in the far north of the Central African Republic (CAR), about 70km from the Chad border. French is the official language and is spoken by those with almost any level of education; Sango is the lingua franca and is spoken by everyone. In the capital, Bangui, French is ubiquitous and I have no problem communicating. In the regions, and particularly small villages, Sango is used almost exclusively, and most foreign aid workers need an interpreter. In the larger provincial towns, such as Paoua – my current location – both languages are used freely, though around 50% of the population struggle beyond French salutations. Although I had some previous experience of working in francophone Africa, in the Democratic Republic of Congo (DRC) during my time in the military, the majority of my work experience involving communication in French has been in France. One of my impressions of the French spoken in the DRC had been the distinct pronunciation, particularly the seeming interchangeability of the letters ‘i’ and ‘u’, with, for example, the adjective dur (‘hard’) spoken as dire (‘to say’). This pronunciation is also prevalent in the neighbouring CAR. One soon becomes accustomed to local accents, however, so it does not hinder verbal communication. The combined pressures of work and studying for an MA in International Policy and Diplomacy mean that I have little time to learn Sango, but it is amazing how far one can go with mbi ye (‘I want’) followed by basic words such as karamen (‘sesame balls’), makara (‘small bread rolls’) and otoro (‘honey’), and then singuila mingi (‘thank you very much’). However, without extensive knowledge of Sango I hit the buffers at times. A large part of humanitarian work centres on the need to pass a message to the local population on the activities of your organisation. Aid recipients must be aware of what you are about to do, how you’re going to do it, and what they need to do to access assistance. It is fitting for the head of a programme to deliver the message. It also shows a willingness to engage. My current method involves writing a speech in French and asking a staff member with some IT skills to create a Word document in Sango for me to read. After a couple of rehearsals, I deliver the speech in both French and Sango, usually to enthusiastic though thoroughly undeserved cheering and the ululating cries used by women in the Central African Republic to express delight. It is wise to explain to the crowd that I do not understand Sango, because the listener will assume, quite reasonably, that if I am making a speech in the language, then I have some level of mastery. Such speeches are usually broadcast on the local radio station too, so people in outlying villages also get the impression that I am fluent in the language. How disappointed they are when I arrive and the truth is revealed! When there are disputes, I require the presence of a staff member with a detailed knowledge of both French and Sango to assist with the negotiations. However, without formal training as either a translator or an interpreter, these volunteers struggle, and much of the meeting can get lost as speakers are allowed to talk at length before any kind of translation is offered in French, despite my attempts to exert control over the situation. Where there is little cultural affinity between the foreign aid worker and the village chief involved in a negotiation, it is wise to sit back and allow the speaker to talk freely. After all, interrupting to demand an explanation in French may be badly received if the Sango speaker is emotionally involved in the matter under discussion. Frustrations should be kept in check. I have recently undergone formal training in mediation techniques, but these focus on the outcome of the meeting. There is some focus on the linguistic processes involved but this centres on those words that should be used and those which should not. My chosen technique is to allow the meeting to run while the non-trained interpreter listens. If I judge that the length of time since the last explanation has been excessive, I present an apology and ask if it is acceptable for me to have a five-minute conversation with my staff member. While this is not my preferred method of using an interpreter, nor is it my preferred style of mediation/negotiation, I have to find a working method, on the spot, if the desired result is to be achieved. That said, there is a great deal of understanding towards me on the part of the local population. This is, in large part, due to the level of fatigue caused by years of civil war and an associated humanitarian crisis which has left the population desperate for any offers of assistance. As a linguist who has lived and worked in several countries where I speak the language fluently, I feel frustrated but tolerant about my current predicament, where I require assistance to communicate with a hefty percentage of the population. Fortunately the Central Africans I have met are naturally helpful, following decades of hardship. 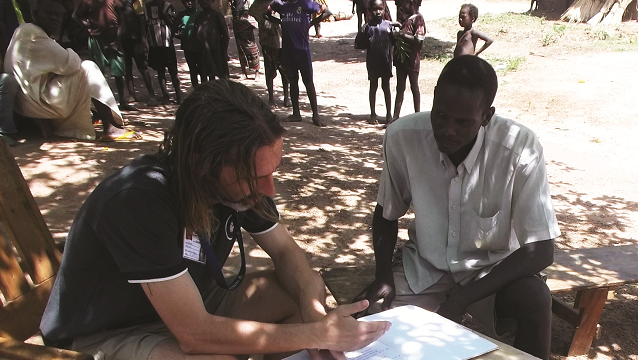 Richard Bretherick runs a programme in the fight against malaria in the Central African Republic.